WASHINGTON — Jesse Shaffer III, his son Jesse IV, and members of their family are just back from Washington where the two Jesses received one of the nation’s highest civilian honors. On Aug. 29, 2012, with the help of a handful of friends and relatives, they saved 120 of their neighbors in Braithwaite, during Hurricane Isaac. Jesse Shaffer III, 54, a native of Central and 1976 graduate of Central High, said the trip to Washington was a memorable and inspirational experience. Congress founded the Congressional Medal of Honor Society to recognize those servicemen who have earned the nation’s highest military honor for heroism. The members of the Society, including the 80 living Congressional Medal of Honor winners, created an award for civilians who have performed similar acts of heroism. The Shaffers were two of the four Americans who received the honor during Medal of Honor Day last Monday in Washington. During Hurricane Isaac last August, Jesse III and Jesse IV stayed behind to guard their home, as did many residents of Braithwaite. The community is located in what can be described as a soup bowl. It is protected by levees but if high waters top the levees, the entire community can be inundated. During the early morning hours of Aug. 29, 2012, that’s exactly what happened. As the Shaffers’ home was going under water, Jesse III and Jesse IV realized their neighbors would be in great danger. So, despite darkness, high winds, and driving rain, they began a rescue operation to save their neighbors, as the water rose by 18 to 20 feet. Joined by two or three other friends and family, they went from house to house in a small boat, puling people off rooftops, breaking through roofs to rescue people in attics, and pulling people out of the water. They made trip after trip, taking people from near death to the safety of the levees. By 7 p.m., they had rescued 120 people — an unprecedented rescue of human life in the face of great danger to themselves. The Shaffers were flown to Washington on Friday and attended a heavy schedule of events, culminating in the award ceremonies on Monday and the laying of a wreath at Arlington cemetery. 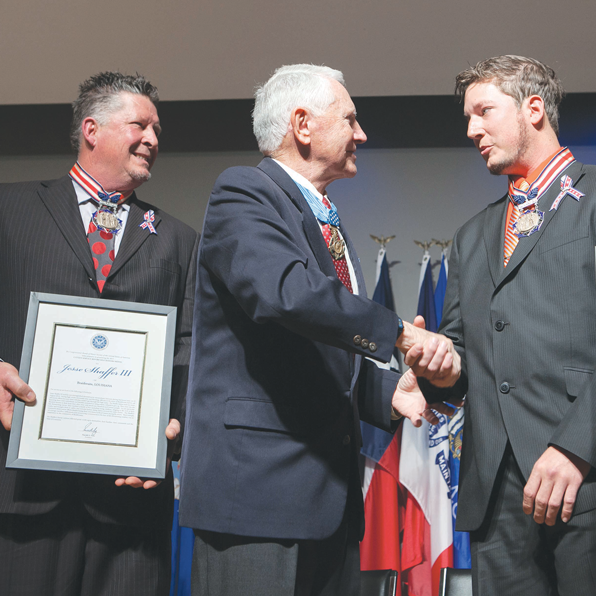 Jesse IV said he will never forget the luncheon on Saturday when the Medal of Honor recipients entered the room one by one and he saw photos of when each of them was in the service. “We went there to represent all of those who helped that day in Braithwaite. It wasn’t just us!” he said. Now Baton Rouge and Central have some new heroes — two men who risked everything to save their friends and neighbors and whose courage should be long remembered. Suzanne can be reached at suelshaffer@bellsouth.net.